The Sonoma Biochar Initiative (SBI), founded in 2009, is a project of the Sonoma Ecology Center (SEC) [www.sonomaecologycenter.org]. We are dedicated to promoting biochar education, production and use throughout Sonoma County. We interact with our strategic partners to educate local farmers, vineyard managers, government officials, and other stakeholders on the advantages of using biochar to enhance agricultural productivity while reducing GHG emissions. SBI sees accelerated use of biochar as the key to soil restoration and recovery as well as a “fast mitigation technology” being cited increasingly in international climate talks. 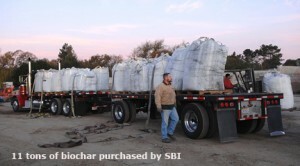 SBI is seeking ways to establish local demonstration projects for biochar production and application, experimenting with available agricultural and urban yard waste biomass feedstocks. SBI has initiated formation of a regular biochar working group of key Sonoma County agencies and other organizations. At this forum members identify and discuss options to include biochar in regional soil and water conservation efforts and in ongoing implementation of Sonoma County’s Climate Action Plan, the country’s most advanced such program. These sessions are hosted by the county’s official climate program implementing agency, the Regional Climate Protection Authority (RCPA) [www.sctainfo.org/rcpa.htm]. Participants in this group include the Sonoma County Agricultural Preservation and Open Space District, Sonoma County Parks, Sonoma Compost Company, Sonoma County Water Agency, Climate Protection Campaign, and others. SBI also continues to monitor the actions of the California Air Resources Board as it implements the state’s climate plan, AB 32; we are especially focused on carbon sequestration protocols and valuation. •Raymond Baltar, a local businessman, professional photographer, and sustainability consultant is focused on integrating business principles with energy conservation and environmental sustainability. Mr. Baltar served on the Executive Committee of the Sierra Club, Sonoma Chapter and on the Steering Committee for Solar Sonoma County. He completed a “Green MBA” graduate degree in Sustainable Enterprise from Dominican University in 2011. •Richard Dale has served as SEC’s Executive Director for 20 years. Programs at the center focused on research, education, and restoration have gained a statewide reputation for excellence. Mr. Dale is recognized widely as one of Sonoma County’s leading environmentalists. •Ray Gallian, SBI’s initial founding member, has focused on biochar technology and its uses over the past several years. Mr. Gallian works primarily on education and outreach to expand biochar use. •Susan Haydon, conservation planner, policy maker, and dirt nerd. Ms. Haydon’s 30-year calling is founded on planning for a sustainable future and fostering a sense of place through community engagement and deep appreciation of our natural systems and working lands. Project manager for Sonoma County Water Agency on water management and climate adaptation initiatives. Organic consultant to Marin & Sonoma County farms. City of Rohnert Park Planning Commissioner. •David Morell, PhD, a specialist in global environmental and energy policy, retired in 2007 as CEO of an environmental consulting firm. Dr. Morell previously served as a senior official of the US Environmental Protection Agency and in California state government and has many years of experience in university teaching and research.